This is a great picture of my dog Gus. I wasn’t sure if I had posted it or not. He is the most beautiful mutt I have ever seen and you can’t tell here but his eyes are two different colors. 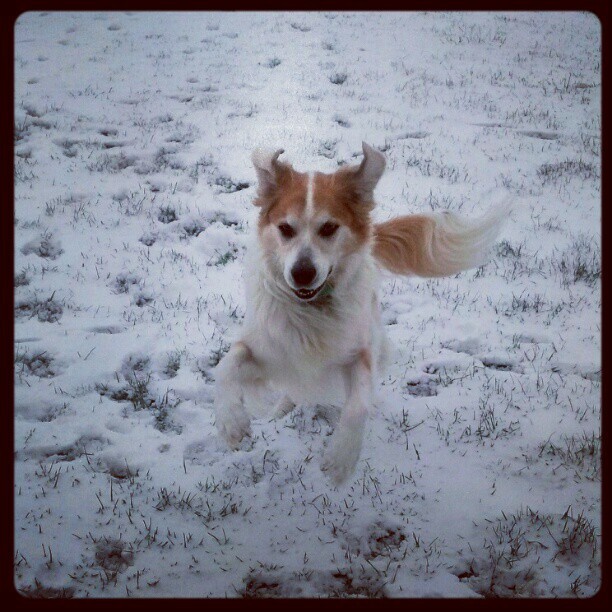 He gets so excited when there is snow on the ground. So as it is beginning to snow right now, I thought I would post one of my favorite pictures of him playing. This is a picture of my dog Primo. She passed away right before Thanksgiving last year. Her 12th birthday would have been tomorrow. I used to make a big deal of it every year. I would get her presents and a special cookie from the dog bakery. She was my everything. She was my baby, my best friend, and my love all wrapped into one little shih tzu. There are still days where all I can do is cry my eyes out because I miss her so much. She was an amazing dog. She would come and cuddle me when I was crying. If I left the house for even 10 minutes when I got back she was overjoyed to see me. When I couldn’t sleep she was right there next to me awake. When I needed to calm down I would go and give her attention. If I was anxious about driving I would just take her along because she loved car rides. She saved my life more than once. When I found out I was not going to be able to have kids, it was a little less devastating because I had her. To say the least my heart is broken without her. And it is even harder to cope being that I can not even afford the fees to adopt a shelter dog. I never knew how expensive it was to adopt a dog in need. But that is beside the point. No dog will ever be her. I miss her so much. And because there has been a death in the family and there is a funeral tomorrow, I feel like I have to keep this hurt of it being her birthday kind of to myself. So I will just blog it into internet space and keep my tears to the secret hours of the late night. I miss you so much Primo baby!!! !